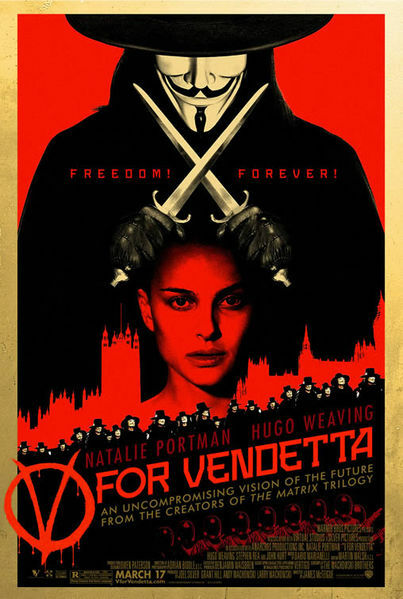 Last Friday saw the release of the new film V for Vendetta, written by the Wachowski brothers of Matrix fame, and based the graphic novel by Alan Moore. Moore's other works over the years include The Watchmen, From Hell, and The League of Extraordinary Gentlemen. Given the dismal film adaptations of the latter two in years past, Moore understandably disassociated himself with this project. . . big mistake. V is the story of a terrorist known only as V(Hugo Weaving, The Matrix, The Lord of the Rings) amidst a futuristic facist British society who is fighting back against the oppressive government with such banners as 'people should not be afraid of their government, a government should be afraid of its people.' The story also includes a protege of sorts to V in the character Evey(Natalie Portman, Star Wars), who is taken under the wing of the ararchist as he battles the government. Although it is advertised as an action film, V is really much for of a drama, with much more time given to a very strong and solid character development than action and effects. It's a little over 2 hours long, but that wasn't any bother to me as well done as the film was and involving as the plot becomes. The acting by the two stars is superb, and they are butressed by a strong supporting cast as well. The film, however is not with out it's controversial topics(it's handling of some of which earns it a lower rating from some other reviews, including Christianitytoday.com), among which are homosexuality, Christianity, and, of course, politics. If you want my views on homosexuality, you need only read Leviticus 18:22 and Matthew 22:39. V views homosexuality from a very liberal vantage point, and also takes a stand against a heartless brand of ultra-conservative Christianity that fuels hatred and oppression of peoples(the homosexuals among them) in this future. Any 'Christianity' that promotes hate or the mistreatment of a person I stand against as well, as would Christ I expect, who taught again and again on the importance of loving people--even those who are in sin. As for the political blows dealt by the film, I feel like the conservative politics of V are so far removed from those actually practiced in the U.S. today that there should be no offense taken; the film should only offend conservatives as much as 1984 did liberals. But go see the film if you're looking for something fun-yet-thought provoking, and consider the more controversial themes for yourself; I highly recommend it. Please note: V for Vendetta is rated R for strong violence and some language.